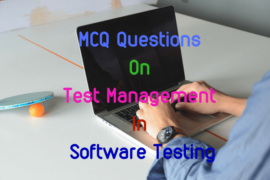 This collection of solved multiple choice questions on software engineering includes MCQ questions on definition of software engineering along with different ways of software maintenance. It also includes about serial or linear sequential, rapid application development and iterative development model along with the different phases involved in developing a software. 1. …………………. software resides only in read only memory and is used to control products and systems for the consumer and industrial markets. 2. …………………. software makes use of non numerical algorithms to solve complex problems that are not amenable to computation or straightforward analysis. 3. …………….. is a sub discipline of computer Science that attempts to apply engineering principles to the creation, operation, modification and maintenance of the software components of various systems. 4. 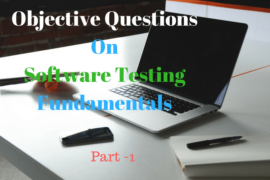 The cost of software engineering includes approximately …………… of development costs and …………. of testing costs. 5. Software maintenance refers to the support phase of software development which includes. 6. The ……………… model stipulates that the requirements be completely specified before the rest of the development can processed. 7. State whether True or False for Rapid Application Development (RAD). i) RAD is not appropriate when technical risks are high. ii) For large but scalable projects, RAD requires sufficient human resources to create the right number of RAD teams. 8. ………………… model couples the iterative nature of the prototyping with the controlled and systematic aspects of the linear sequential model. 9. ………………………. is a function of the number of failures experienced by a particular user of that software. 10. 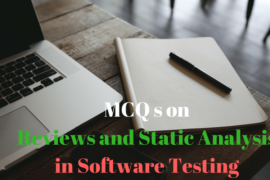 Statistical testing is a software testing process in which the objective is to measure the …………….. of the software rather than to discover software faults. 11. …………….. results in modification to the software to accommodate changes to its external environment. 12. …………….. extends the software beyond its original functional requirements. 13. The ………….. model suggests a systematic sequential approach to software development that begins at the system level and progresses through analysis, design, coding, testing and support. 14. Which of the following activities includes in linear sequential model for software development. 15. ……………… is actually a multi-step process that focuses on four distinct attributes of a program, data structure, software architecture, interface representations and procedural detail. 16. The ……………….. assumes the requirement of a system which can be baseline before the design begins. 17. ……………… is a document driven process that requires formal documents at the end of each phase. 18. …………………. is an incremental software development process model that emphasizes an extremely short development cycle.